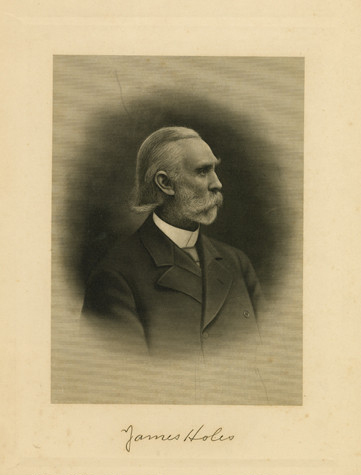 Lithographic engraving of James Holes (1845-1916), circa 1900. Courtesy NDSU Archives, Photo 2093.2.6. The James Holes house is one of the oldest buildings in Fargo to be standing in its original location. Built in 1879, the home attracted considerable attention due to its size and quality of construction. At the time it was built, the house was approximately one mile north of town. The 1880 City Directory lists the address as “Broadway. North of city limits.” It was surrounded by a healthy wheat field, dotted with barns and sheds. The owner, James Holes, combined hard work with luck and business intuition to build a farming empire in the area. This fine home stands as a testament to its original owner, as well as the staying power of the community it is a part of, for the home is now completely swallowed in a sea of homes, nowhere near a barn or a stalk of wheat. James Holes was born in Warren, Pennsylvania on January 29, 1845. His parents immigrated to the United States from Derbyshire, England in 1832. After the death of his father when James was 15, he followed the advice that Horace Greeley gave to plucky young boys at the time: “Go West, young man.” He took his inheritance and settled in St. Cloud, Minnesota. Holes first came to North Dakota driving a covered wagon for the government in 1868 or 1869. His route was St. Cloud to Fort Abercrombie, the former being the end of the Northern Pacific Railroad at the time. He returned in 1871 as a land agent for the Puget Sound Company, to build and run a supply store in the area that would become Fargo. Legend has it he was greeted by the sound of a man playing violin and a woman dancing outside a tent. They turned out to be Captain and Mrs. George Egbert. The Captain would become Fargo’s first mayor. Holes became a very influential land owner and citizen of Fargo. Click the icon above to hear a reading of James Holes’ memories of arriving in Fargo in May of 1871.